NeNe Leakes has been on Real Housewives of Atlanta for a minute now and she isn’t shy about telling you she’s an OG. Actually, NeNe isn’t shy about much of anything. Season 11 proved to be a trying time for NeNe and she wasted no time in making every single thing about herself. If a situation did not highlight her in some way, she made sure it did. While living life in front of the cameras, MeMe grabbed the spotlight from Eva Marcille’s wedding. When pregnant Porsha Williams complained of back pain, NeNe let you know her pain was worse. When former cast mate Kenya Moore showed up at a party thrown by Cynthia Bailey, NeNe demoted Cynthia from friend to co-worker. And as we all know, husband Gregg Leakes is suffering from colon cancer – but NeNe’s suffering outweighed his by miles. Petty, it’s what’s for dinner! The only person this season who gave it right back to NeNe was Tokyo tour guide Aya, who doubled down on “being on time” and left NeNe in the dust when she was late for group activities. 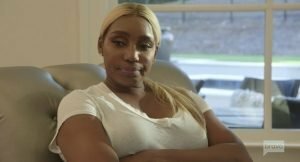 After a turbulent season of losing friends, NeNe is speaking about who should stay, who should go, and who should join the next journey of RHOA. I have an idea, can we give Aya a peach? Can we all agree this was a direct assault against Cynthia? She has never been known for a particularly volatile attitude. She has a daughter who is in college with no arrest record (ahem, Bryson Bryant). And if I’m being honest, aside from the hands-on squabble with Porsha on a boat, Cynthia isn’t terribly controversial. Since Cynthia’s “betrayal,” NeNe is definitely coming for her camera time. Paging Kenya Moore, Kenya please call the Bravo courtesy phone immediately. Don’t worry, I’m kidding. Or am I? TBH I would love for someone who really gets underneath NeNe’s skin to show up and make her more nuts. While I’m at it, where in the world is Claudia Jordan? She was never afraid to come for NeNe. As for bringing back an enemy of NeNe’s, the only enemy she doesn’t have is her mirror. NeNe went on to mention that the cast would remain volatile regardless, “these girls have all physically fought,” in what I assume is a compliment to herself. While MeMeMeMe hasn’t directly come to blows with any of the ladies, I think there’s a person on Bravo production who is suffering from PTSD whenever he walks by an open closet door. !” Does Tamar watch this mess? Would she even be interested in joining a program where she would undoubtedly fall victim to NeNe’s wrath? Everyone else does, why would her soul be spared? No matter what happens, NeNe assures us she isn’t going anywhere. Gee, thanks? Will Season 12 be the continuing story of the NeNe Show? Bravo worships her, so it is highly possible. Madame NeNe Leakes – she’s here, she’s feared, get used to it. TELL US- WHO DO YOU WANT TO SEE ON THE NEXT SEASON OF RHOA? WHO WOULD YOU LIKE TO SEE LEAVE? WILL WE SEE A GENTLER NENE GOING FORWARD?